Fellow bloggers, I know many of you swim in the vast sea that is WordPress. It’s free, easy to get setup and has lots of automatic fixes in the form of plugins. As far as blogging engines go it’s pretty nice. Today I’m going go make a case or three for why you may not want to use WordPress for your site, though. And tell you why we moved from WordPress to ExpressionEngine and finally to Craft CMS. Ready? Here it goes. When we started this blog (formerly Last Night Ago), I was busy, didn’t want to pay for software and thought I’d give WordPress a shot. For my clients at FortySeven Media I have historically always built ExpressionEngine sites, so this was hard for me to deal with at first. But I wanted to give WP it’s fair shake. Images uploaded from our phones weren’t rotated properly. Had to add a plugin to make that work, but it didn’t fix things retroactively so I had to re-upload a bunch of images. Image management in general was abysmal. The interface is confusing and weird. You only get 3 options for resizing, and WP stores all those versions in the same folder as your main images. So if you happen to change one of those other sizes you just bloat that images folder - and because the image linking is done through the text editor field and not the templates, it’s hard to change the sizes of your images site wide (like you would during a redesign). I’ll explain how images are handled so much more elegantly in other systems later. While the publishing area has come a long way, I still don’t agree with how images are inserted into content, custom fields feel like they’re hacked on and most importantly Ashley found the whole thing pretty confusing. She hated it. The last straw for me after fighting with all these little things was the security issues that WordPress has. If you don’t upgrade immediately you’re going to get hacked. The problem is upgrading all the time causes potential incompatibilities with plugins. And you need a lot of plugins to make stuff work right. During one of those in-between times, our site was indeed hacked. After that I just blew it up and re-built in ExpressionEngine. That worked fine for another year or so. But EE has it’s own set of problems. While it’s more secure and doesn’t need constant updating, you have to throw about $800 - $1,000 worth of licensing and add-ons to get a good publishing experience. And even with that we were flying blind publishing without built-in live previewing. Which brings me to the publishing flow. EE really is a whole lot better than WordPress, but one of the biggest reasons we moved to Craft CMS was it’s combo of the Matrix Content field type and Live Previewing. It’s kind of hard to explain just how cool this is, so here’s a quick video of how it works. P.S. Craft has a more concise version of this here. The cool thing about this setup is that it gives you infinite flexibility in terms of both content and markup. A good example is video. If you embed a YouTube video and want it to scale with the width of your site you need some special code to make that work. With Matrix I can setup a video content type, paste in the share code from YouTube and add my custom markup in the template so we never have to worry about it when we’re creating content. Same with images. They’re not getting injected right into the text where it would be nearly impossible to resize them or change some of their attributes in the future. Craft stores it’s images in a main folder and you can setup as many resize transforms as you want. The resized images are stored in their own folders so it keeps things nice and clean. More than anything, though we’re looking to the future. WordPress handles blogs great, but anything else gets pretty messy. And ExpressionEngine can do just about anything, but quite frankly has lost it’s momentum. Craft is a rapidly growing platform that’s modern in it’s codebase. You can even access the control panel from your phone with no problem. And as we grow BareNeckers we have the ability to build anything - from gated content to a store to whatever. Craft is that flexible. Remember how many add-ons and plugins we’d need to add to ExpressionEngine or WordPress to make something kind of like this work? Craft has pretty much everything you’d need already built in. I’ve only added one plugin for our crazy map setup and one that gives us useful reports from Google Analytics. Did I mention you can update everything with one click? Craft isn’t free, but it’s pricing is really fair considering it comes with just about everything you’d need out of the box to build a travel blog. You could get away with the free version if you’re the only one updating. Otherwise it’s $199 or $299. 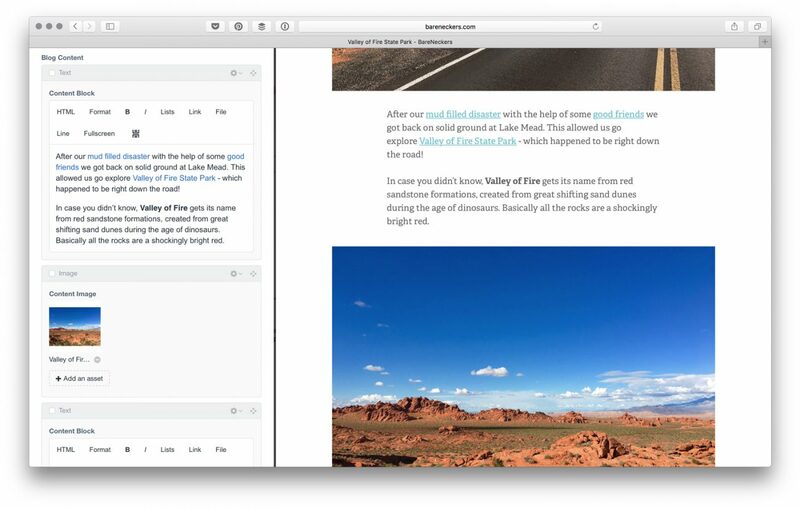 It would take some development to get setup, but once it’s running, you’re looking at a much faster, sleeker and easier to use publishing area. It’s more secure and you’ll genuinely enjoy making content again. And you can keep the main site clear of unwanted scripts and stylesheets so it’s fast and you get better search rankings. We love it! So that’s my case for ditching WordPress and moving to Craft CMS for your travel blog. Enjoy!